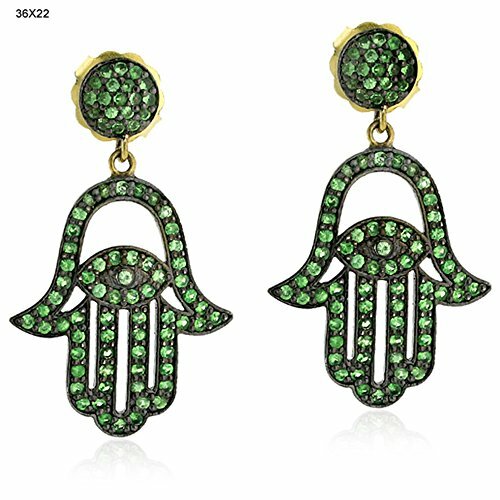 Tsavorite Hamsa Style Dangle Earrings in 14K Yellow Gold & Sterling Silver by Mettlle at Blood of The Young. MPN: OPS-8407. Hurry! Limited time offer. Offer valid only while supplies last. All our Diamonds and Gemstones are Natural and Conflict Free. One of a Kind Design with Exquisite Craftsmanship. Valuable Collection for Women and Girls. Great gift to express your love for your mother, girlfriend, fiancee, wife, valentine, family or just a friend on Mothers Day , Wedding , Anniversary day ,Valentines Day or Christmas Day etc. If you have any questions about this product by Mettlle, contact us by completing and submitting the form below. If you are looking for a specif part number, please include it with your message.